Welcome to this second issue of Highland Biodiversity News, the newsletter for biodiversity in the North. This short paper aims to provide an annual update of what's happening with regard to biodiversity across the Highlands. Biodiversity or 'biological diversity' is a relatively new approach that, although linked to traditional approaches to nature conservation, presents a more inclusive approach that focuses on sustainable and wise use of resources rather than designated sites and protection of rare species. As a region, Highland is extremely important for biodiversity. From the high mountain tops to the deep muddy basins of the West Coast sea lochs, we have a tremendous variety of habitats and richness of species that is unequalled anywhere else in the country. Highland supports 192 of the 238 priority Scottish species and 40 of the 42 priority Scottish habitats identified in the UK Biodiversity Action Plan. This presents us with a somewhat daunting responsibility, and the Highland Biodiversity Project represents a first step towards an integrated approach to the management of biodiversity in the area. The Highland Biodiversity Project is a two year initiative that aims to raise awareness, and identify and initiate priority actions for biodiversity across the Highlands, through an action planning process strongly influenced by local people. It is funded by The Highland Council, Scottish Natural Heritage, Highlands & Islands Enterprise, Caithness & Sutherland Enterprise and RSPB Scotland, with match funding from the Highlands & Islands Special Transitional Programme. Six local biodiversity action plans are being produced, for the areas of Caithness, Sutherland, Wester Ross, Ross & Cromarty East, Skye & Lochalsh and Lochaber. Of these, the Caithness Biodiversity Action Plan was launched in February, the Sutherland Biodiversity Action Plan has been consulted on and will be launched in June, and the Skye & Lochalsh Biodiversity Action Plan will be consulted on in May and June. Attendees at the Launch of the Caithness Biodiversity Action Plan, at the Dunnet tree nursery. A workshop was held in April in Achnasheen to start the biodiversity action planning process in Wester Ross, and a group of local people has been initiated to help write the plan. Workshops are planned for Ross & Cromarty East and Lochaber in late May and early June respectively. The Project has a small budget to support community-led practical projects and awareness-raising events. 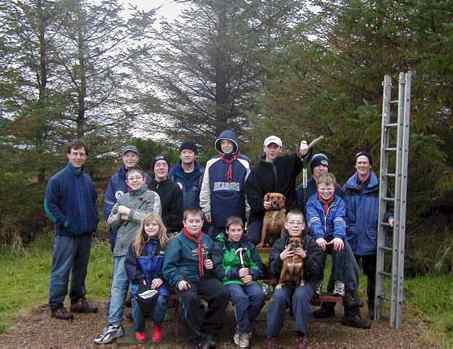 Members of Dunnet Forestry Trust have started a small tree nursery in the forest, with the help of the local Scout Group. Lybster Community Council and the Caithness Ranger Service are working on a project to replace an old, derelict coastguard lookout hut with a flagstone shelter and interpretative panel, to help people wishing to watch marine wildlife. 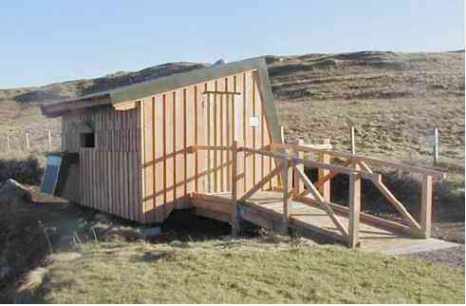 Scourie Community Council and the Sutherland Ranger Service have erected an all-abilities hide to help people watch marine mammals and birds (also funded by SNH and Scourie Estate). The Allt Beag Armadale Trust plans to plant a small field as a wild flower meadow, and plant native trees to improve the biodiversity of a small woodland on their community croft. Pupils of Rogart Primary are undertaking a willow coppicing and wildlife hedge laying project in their school grounds, under the guidance of Mike Ellis, a local wood-working expert. The Kyle of Tongue Development Group have been awarded a small contribution towards the clean-up of the Glebe Woods, as a first step in a larger interpretation and improvement project based on ideas by local children. A number of Primary Schools throughout Skye & Lochalsh have put up nest boxes with cameras, to enable pupils to watch birds nesting from their classrooms in a project co-ordinated by RSPB and the local rangers. Skye and Easter Ross, are undertaking wildlife gardening projects, with help from the National Trust for Scotland and Highland Council Ranger Services. The Broadford Environmental Group is undertaking a project to control Japanese knotweed around the village, as this is threatening the native biodiversity. purchase plants for the new wildlife pond at Tain, as a contribution to a larger project run by the Tain Initiative Group. Residents of Ulbster, in association with Yarrows Heritage Trust, are undertaking regular visits to the area around Loch Watenan, to observe how the plant, bird and invertebrate life changes through the seasons. The Friends of Newtonhill Group, in conjunction with the Caithness Ranger Service, are holding a number of Open Days in Newtonhill Forest, to find out about the wildlife that live there. 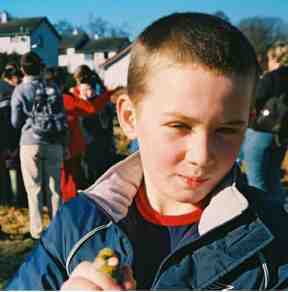 Pupils of Stoer Primary School have started work on a big project to find out 'What lives in our loch?' involving the erection of a hide and the purchase of microscopes, binoculars and other equipment to look at the loch environment. The community of Ardgay are holding a number of site visits, open days, training events and school projects to map the woodland habitats in the Gearrchoille Woodland. It is hoped that this information will feed into future management and interpretation projects. Gavin Maclean with a greenfinch at the Gearrchoille Woodland Open Day. 268 birds were caught and ringed on the day, and 52 nest boxes were built and erected in the wood. The Strathcarron Centre is hosting a photographic exhibition and producing materials to raise awareness of the biodiversity of the Lochcarron area. Members of Aultbea and Laide Community Woodland Group are undertaking a wildlife survey of their woodland. The Isle Martin Trust and pupils of Ullapool High School are looking to find out about the wildlife of the island and run guided walks over the summer. The Skye & Lochalsh Biodiversity Group is also hoping to fund a Marine Awareness Day and a series of Wildlife Gardening events in the Summer. Milton Community Woodland has been awarded a small grant towards nature based activities and the building of a tree nursery and bird hide. The Highland Biodiversity Project is piloting a Marine Innovation Award Scheme in 2002 and 2003. The Scheme aims to reward projects and companies for innovative works that demonstrate best practice in the sustainable use of our coasts and inshore waters. A total of £7,500 was given to the winners of the 2002 round, which will be used to help develop their businesses or work in some way. Fishing Category: Loch Torridon Nephrops Creel Fishery Escape Panel Project (£2,000). Jointly awarded to Shieldaig Export Ltd and the Highlands & Islands Fishermen's Association for their project to fit escape panels to all creels used by boats landing prawns with the company, and demonstrate the results to fishermen. Aquaculture Category: Prolonged Fallow Improves Biodiversity (£1,500). Awarded to Loch Duart Ltd., for a project to monitor the extended fallowing period of fish farm sites. Aquaculture Category: Native Oyster Project (£1,500). Awarded to Kyle of Tongue Oysters for their work in improving native oyster populations in North Sutherland. General Marine Environment Category: Installation of ROV and Display Screen (£2,500). Awarded to Seaprobe Atlantis, a company offering glass bottomed boat trips in Loch Alsh, which includes part of the 'Lochs Duich, Long and Alsh Reefs' candidate Special Area of Conservation. with Cllr Ian Ross and Lord Lindsay. The Award receives additional sponsorship from the Crown Estate, Fishmongers Company, Mallaig and North-West Fishermen's Association and The Highland Council. 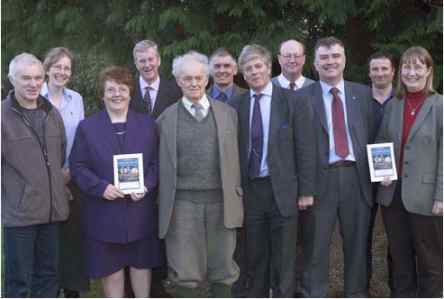 The Cairngorms Local Biodiversity Action Plan was launched last December in Strathdon. Peter Cosgrove, the Cairngorms Biodiversity Officer continues to work with local authorities, agencies and other partners over the delivery of the plan, which will also now be taken forward in liaison with the newly formed Cairngorms National Park Authority. A number of practical biodiversity projects have been initiated under the Cairngorms Biodiversity Project, and an update is given on page 4. Cairngorms Upland Grain Project is now into its forth year of operation, and has attracted a lot of support and media coverage both within Strathspey and from outwith the Cairngorms. • Peter has continued to raise the profile of pearl mussels by contributing to television and radio programmes as well as advising Scottish Natural Heritage on their new River Chest initiative. • The project has been working with a local farmer to (re)create a functional Aspen habitat network between Grantown and Nethy Bridge. • Plantlife and SNH have found a new population of the very rare UK BAP priority species, Blunt-leaved bristle moss in the Cairngorms, and funding has been secured for a small survey to look for further new populations. • A grant application has been successful for a farmland wader project in Badenoch, Strathspey, Glenlivet and Tomintoul, working jointly with Cairngorms FWAG, SNH and RSPB. • A practical guide for developers and woodland managers on the issues surrounding woodants was produced, in association with SNH. • The project secured modest funds to help the Grampian Ring Group continue their work into the breeding biology of the poorly known Twite. Jonathon has upgraded the Recorder 3.3 system in the Museum to Recorder 2000 which will permit easier electronic input of data once it is fully functional. Newsletter 16 contains reports on our Mammal Atlas and Bumblebee Atlas projects as well as ongoing and new projects on organisms as diverse as plant galls, carnivorous necklace shells, speckled wood butterflies and beeflies. Other articles cover ecology of one of the rarer bumblebees, white heathers, flies and lampreys. There is an article on Local Patch Recording by Ian Evans which is of particular relevance to the readers of the Biodiversity newsletter. Finally if you ever have left over wine you can even find out how it can help you to identify moths in your garden! 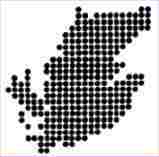 The Newsletter contains a listing of events and fieldtrips organized by HBRG and a number of other groups in the Highlands. If you would like e-mail notification of what’s on send your e-mail address to: HBioRG@aol.com putting "HBRG update" in the subject. E-mailings will be sent out as "blind copies" so your e-mail address won’t go to anyone else. The above address can also be used to submit records electronically or send in articles for the Newsletter. Copies of HBRG Newsletter 16 are available to non-members for £3.00 but of course for just £4.00 you can join HBRG and receive the Newsletter free.